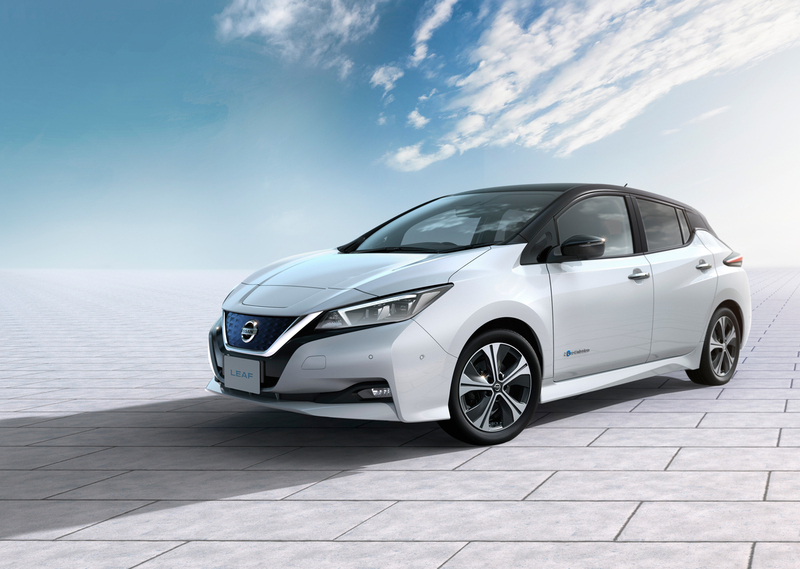 The Nissan LEAF has been completely reinvented, combining greater range with a dynamic new design and advanced technologies*, representing Nissan’s technological leadership. The new Nissan LEAF offers a range of 400 km (Japan JC08 cycle**), allowing drivers to enjoy a safer and longer journey. The new e-powertrain gives the new Nissan LEAF 110 kW of power output and 320 Nm of torque, improving acceleration and driver enjoyment. 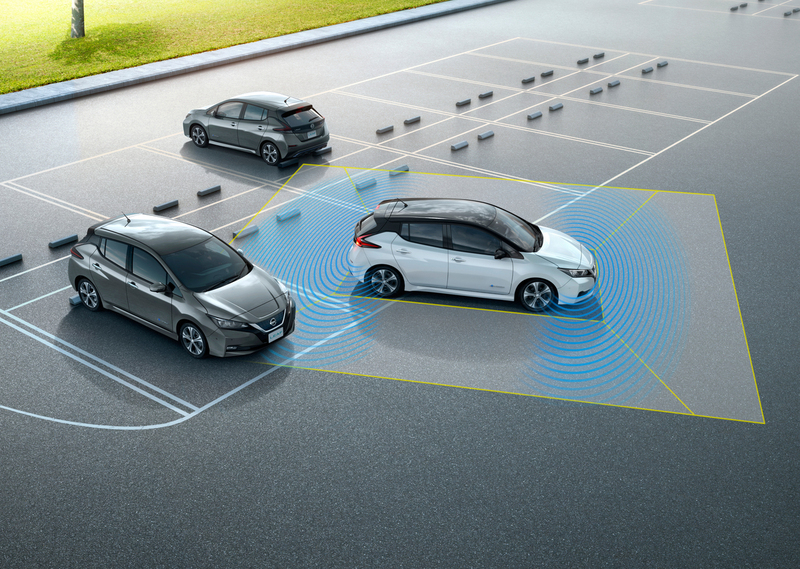 The new LEAF features ProPILOT autonomous drive technology, used during single-lane driving on the highway. It also offers ProPILOT Park. When activated, the car’s ProPILOT Park technology takes control of steering, acceleration, braking, shift-changing and the parking brake to automatically guide it into a parking spot. It enables the driver to park safely and simply, even when parallel parking. The new LEAF’s revolutionary e-Pedal technology transforms the way people drive. It lets drivers start, accelerate, decelerate and stop by increasing or decreasing the pressure applied to the accelerator. When the accelerator is fully released, regenerative and friction brakes are applied automatically, bringing the car to a complete stop. The car holds its position, even on steep uphill slopes, until the accelerator is pressed again. The reactiveness of the e-Pedal maximizes EV driving pleasure. The new Nissan LEAF’s design includes a low, sleek profile that gives it a sharp, dynamic look. Along with excellent aerodynamics, the styling – from the sleek silhouette to the car’s “advanced expression” – evokes the exhilaration of driving an EV. Familiar Nissan design features include the signature boomerang-shaped lamps and V-motion flow in the front. The flash-surface grille in clear blue and the rear bumper’s blue molding identify the car as a Nissan EV. The new Nissan LEAF’s completely redesigned cabin is focused on the driver, featuring a front panel in the form of a “gliding wing.” It combines an excellent use of space with functionality. The interior design creates a relaxed ambience and premium quality feel, due to carefully selected materials. 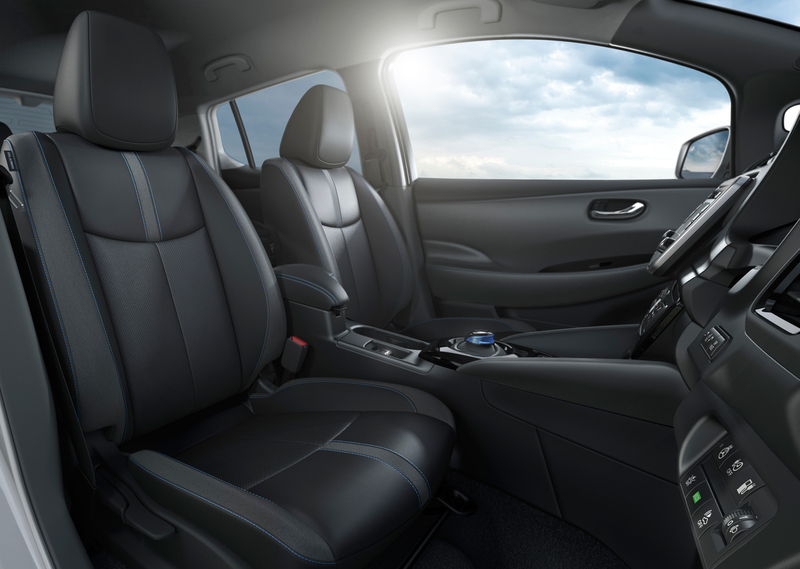 Vibrant blue stitching in the seats, dashboard and steering wheel has been incorporated as a symbol of Nissan’s electric vehicles. The 7-inch, full-color (TFT) display has been redesigned to highlight key features, such as the Safety Shield technology power gauge and audio and navigation system information. Apple CarPlay has also been added. For customers who want more excitement and performance, Nissan will also offer a version with more power and longer range at a higher price in 2018 (timing may vary by market). The new Nissan LEAF will go on sale Oct. 2 in Japan. The model is slated for deliveries in January 2018 in the U.S., Canada and Europe.